3. 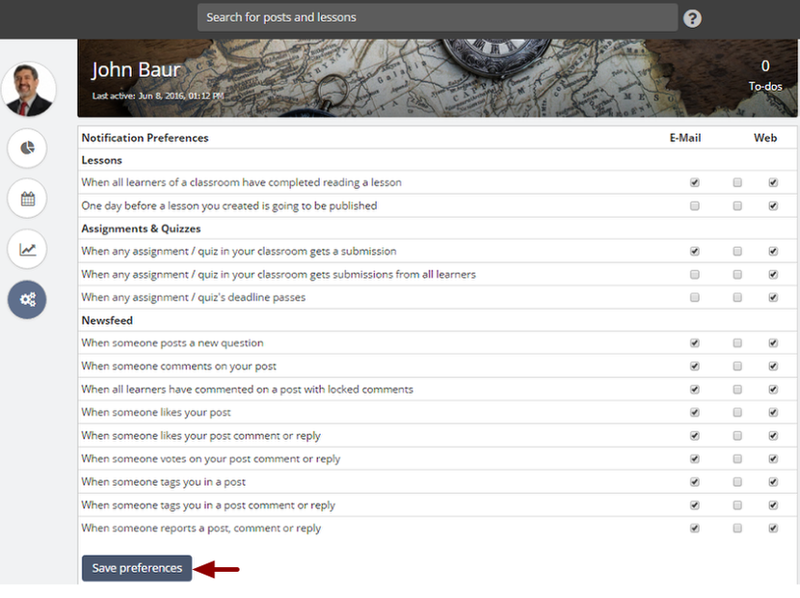 On the Notification Preferences page, you can select which notifications you would like to receive for your classrooms. 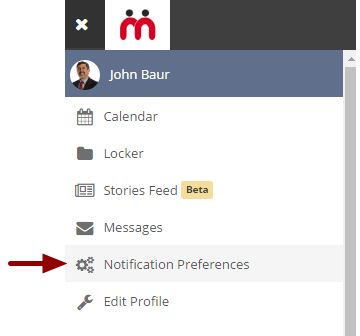 Select the E-mail checkbox next to the notification preference you’d like to receive. 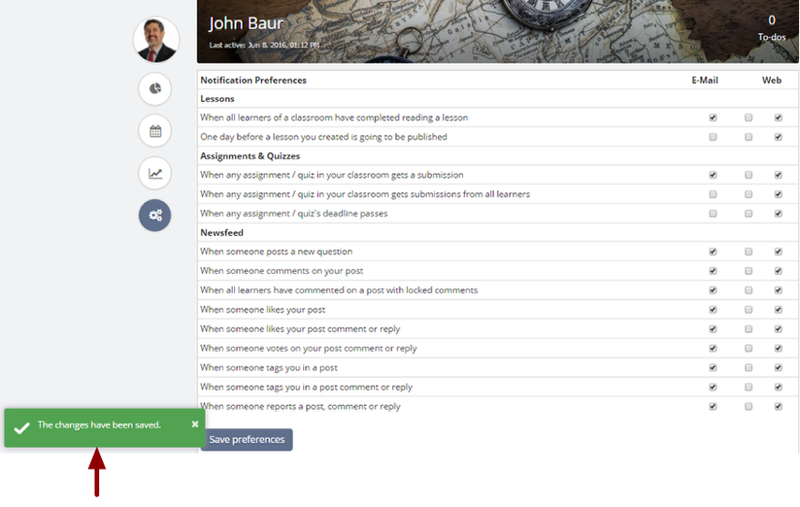 In this case an email will be sent to you when all learners of a classroom have completed reading a lesson. Select the E-mail checkbox next to the notification preference you’d like to receive. 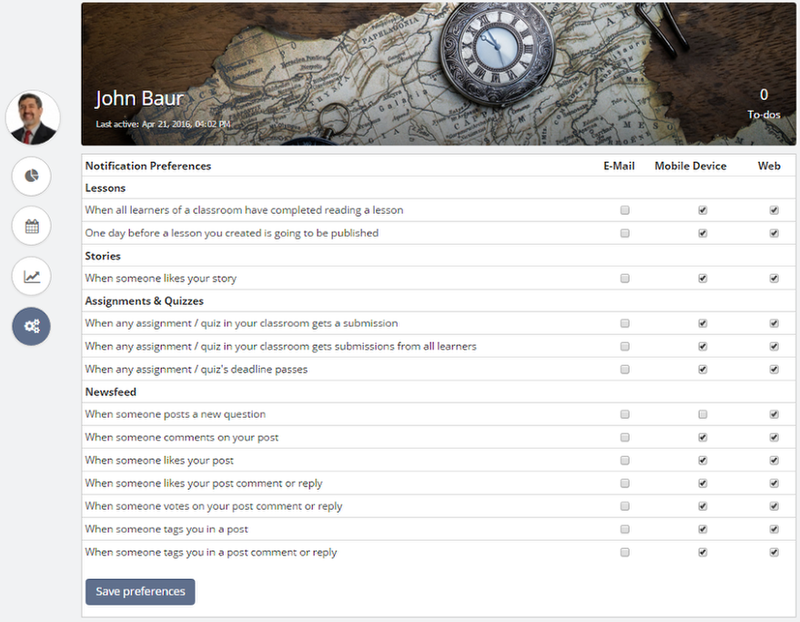 In this case selecting email notification for 'when any assignment / quiz in your classroom gets a submission' action will send an email to you when any assignment / quiz in your classroom gets a submission. Select the E-mail checkbox next to the notification preference you'd like to receive. 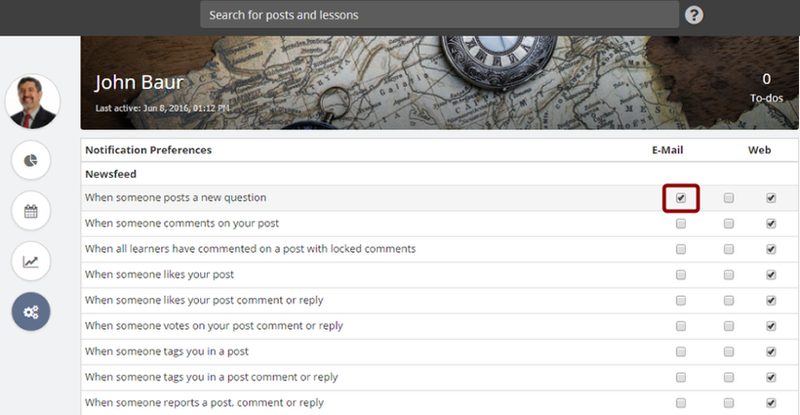 For instance, selecting email notification for ‘When someone posts a new question’ action will send an email to you when someone posts a new question in your classroom. 7. Click Save Preferences to save the changes. 8. A message appears confirming that the changes have been saved. 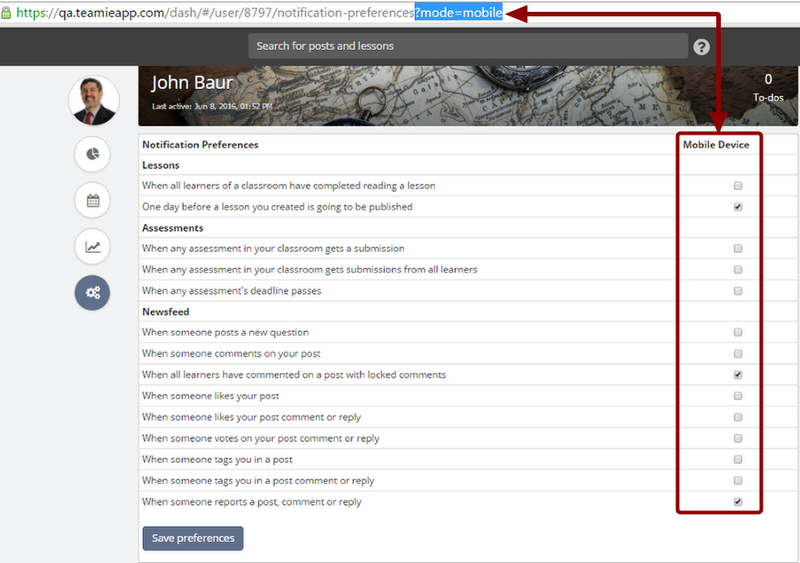 On the Notification Preferences page, you will see all the supported notifications options altogether, i.e. E-mail, Mobile Device and Web notifications. You can choose only to see certain notification option at a time. 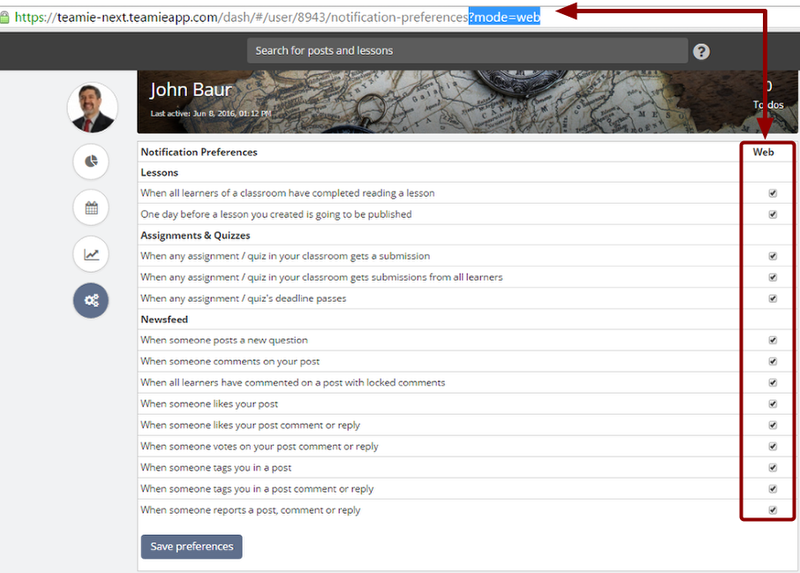 For example, if you want to change notifications settings for Web then you can use the related URL parameter in the address bar and when page is reloaded only the web notification will appear on the page. Don't worry its session specific and other options are not removed permanently. Let’s see how you can do it! 1. 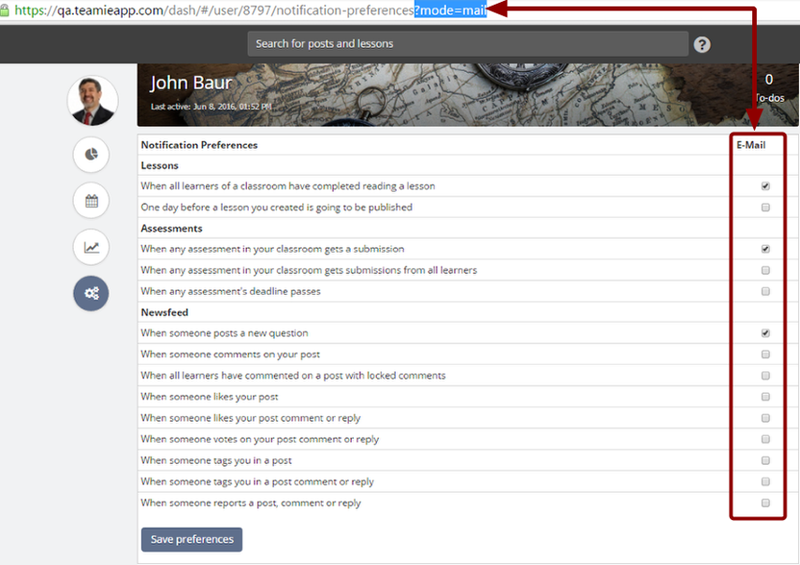 In order to view and change only the notification settings for Web, then type ?mode=web after the /notification-preferences text in the address bar and press Enter. When the page reloads, you will only see the web notification option for the available actions. 2. In case you wish to view and change only the notification settings for Mobile Device, then type ?mode=mobile after the text in the address bar and press Enter. After the page reloads, you will only see the mobile notification option for the available actions.